Chatles Hallé was born Karl Halle in Hagen, Westfalia. His father was an organist and gave him his first lessons. His participation in a concert in Kassel in 1828 attracted the attention of Louis Spohr. In Darmstadt he studied with C.H. Rinck and from 1836 to 1848 he lived in Paris where he knew Cherubini, Chopin and Liszt. He also befriended Alfred de Musset and George Sand. He married Desirée Smith de Rilieu in 1841. In 1848 he left Paris during the revolution and settled in London with his wife and children. In England he worked as a pianist as well as a conductor. He performed all Beethoven's piano sonates in England. he held piano recitals at his home and from 1861 onwards in St James's Hall, Piccadilly. In 1853 he had moved to Manchester, where he formed the Hallé Orchestra, that started as a small orchestra to play for Prince Albert in 1857. He reached a very high level of perfection with his orchestra that still exists. His first wife had died in 1866 and in 1888 he married the violinist Wilma Neruda, the daughter of Josef Neruda and widow of Ludvig Norman. In 1888 he was also knighted. In 1890 and 1891 he toured with his wife in Australia and other countries. He died in Manchester in 1895. 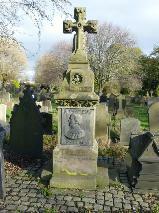 The grave of Charles Hallé at Weaste Cemetery, Salford.